Grand Hall USA began decades ago to enhance everyday life with gas products that are uniquely styled, sustainably efficient, and performance oriented. The company believes in acting locally to better serve their customers. Investing in that philosophy, Grand Hall USA opened its doors in Dallas, Texas in 1985 and moved to a new 200,000 square foot facility in 2003. Headquarters in Taipei, Taiwan since 1976 and with the US office operating out of Dallas, Texas since 1985, Grand Hall USA serves as the leading manufacturer of innovative gas appliances and components for more than 30 years. Reflecting its corporate commitment to product development, Grand Hall USA recently introduced the patented Crossray cooking system that generates fifty percent more heat than tradition cooking systems. Grand Hall USA’s top award-winning product, introduced in 2006, The Eternal Hybrid Water Heater has received industry accolades including EcoHome Magazine’s Editor’s Choice Award, the Top 50 Innovative Products by Professional Remodeler Magazine, and the number one Cool Products at PCBC, Pacific Coast Builders Conference. Eternal Hybrid and Eternal Condensing Hybrid work on the Counter Flow Principle. This is an opposite approach to the way the industry has traditionally built water heating appliances. 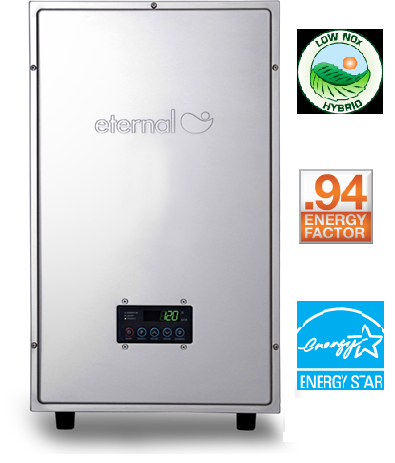 Eternal has achieved the highest efficiency in the industry without sacrificing your comfort, unlike any other water heater appliance. 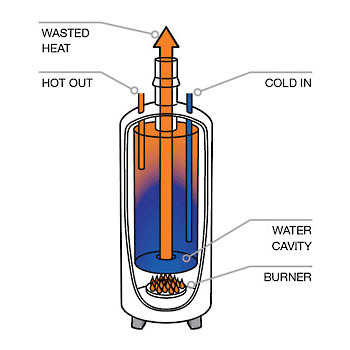 Heat is generated from the bottom of the tank and rises through the centrally mounted exhaust. Cold water enters from the top and deposits sediments at the bottom. 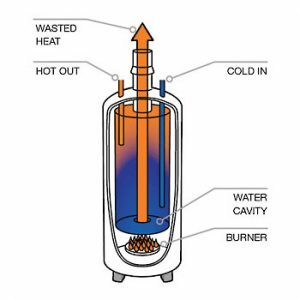 The efficiency of heat transfer is reduced over time as the burner has to work through the build-up before heating the water. The tank is limited in its ability to produce continuous hot water as the heat passes through a large body of water just once. In a tankless, heat is also generated in a bottom up fashion. Cold water passes through a series of coils that reduce water pressure in order to heat water quickly. However, the coils clog up over time with scale build-up that reduces efficiency. Eventually, the coils start to corrode and the heat exchanger will fail. Every time a water faucet is opened and closed, the heating cycle must start over again because the tankless is by flow alone. 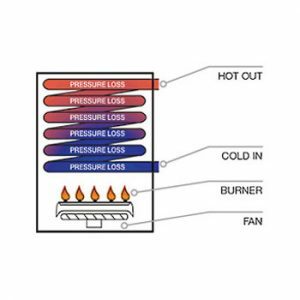 This on/off behavior causes “cold water sandwich” that impacts temperature consistency as well as delay hot water delivery to your applications. The Eternal Condensing Hybrid’s innovative 3 cycle process pushes heat in three directions through the water and maximizes energy transfer. in simplest terms, our patent slows the exhaust of heat by reusing the energy multiple times, rather than reducing water pressure. The end result is a small heat exchanger that is capable of replacing multiple tanks, while supplying endless hot water with consistent water pressure and doing it time after time. The Eternal is the right solution, whether it’s commercial or residential domestic hot water. Its triple pass design provides endless hot water with up to 95% efficiency, and comes with a 15 year residential/ 5 year commercial no leak warranty. Eternal is compatible with most recirculation systems, whether it’s a dedicated return line or under-the sink retrofit pump. 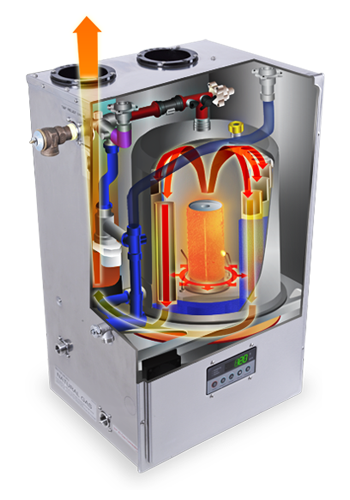 The built-in reserve tank within the heat exchanger makes instant hot water possible. Optional feature. Consult your authorized Eternal dealer.